Just over a year or so ago, Mat Morrison/@mediaczar introduced me to a visualisation he’d been working on (How should Page Admins deal with Flame Wars?) 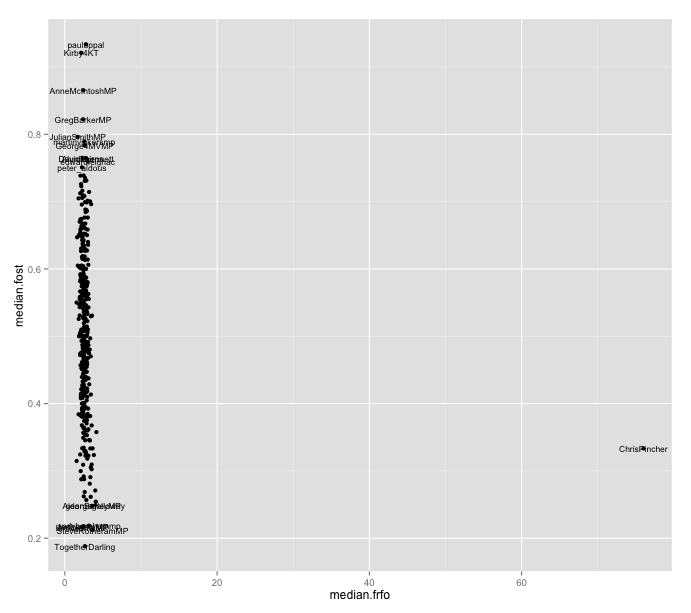 that I started to refer to as an accession chart (Visualising Activity Around a Twitter Hashtag or Search Term Using R). The idea is that we provide each entrant into a conversation or group with an accession number: the first person has accession number 1, the second person accession number 2 and so on. The accession number is plotted in rank order on the vertical y-axis, with ranked/time ordered “events” along the horizontal x-axis: utterances in a conversation for example, or posts to a forum. NOTE: this diverges from the accession graph described above, where accession number goes on the y-axis and rank ordered event along the x-axis. 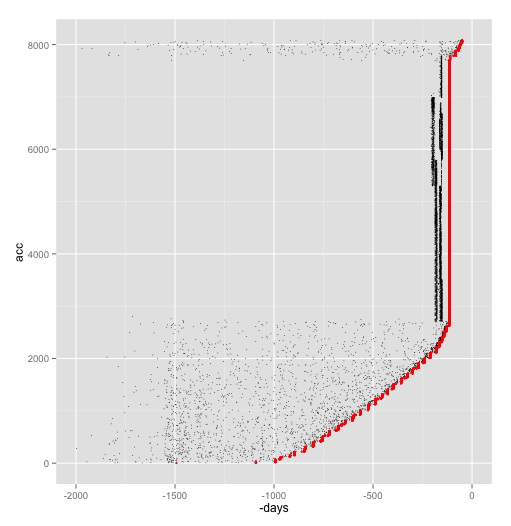 What the chart shows is an estimate (the red line) of how many days ago a follower with a particular accession number started to follow a particular Twitter account. As described in Sketches Around Twitter Followers, we see a clear break at 1500 days ago when Twitter started to get popular. 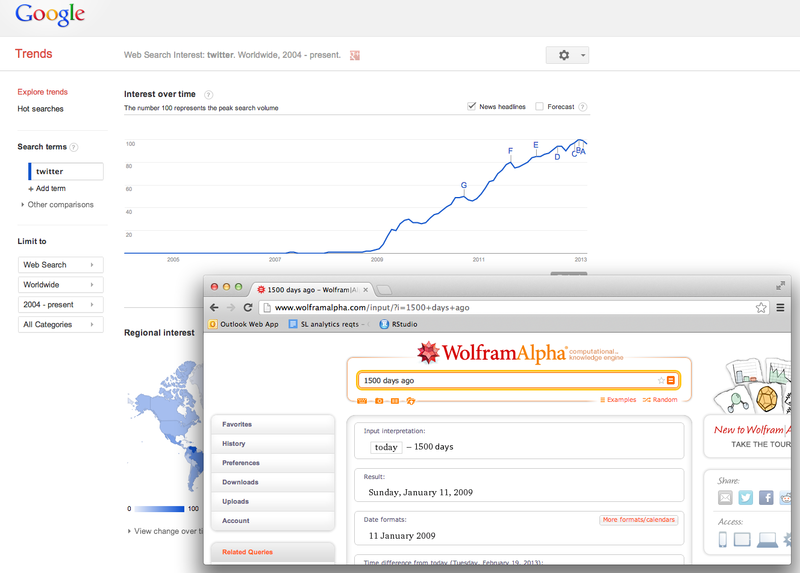 This approach also suggests a technique for creating “follower probes” that we can use to date a follower record: if you know which day a particular user followed a target account, you can use that follower to put a datestamp into the follower record (assuming the Twitter API returned followers in reverse accession order). 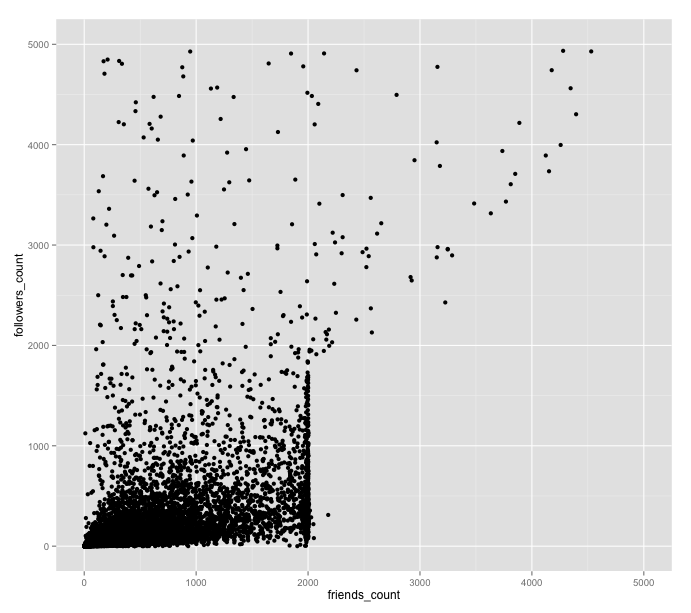 Here’s an example of the code I used based on Twitter follower data grabbed for @ChrisPincher (whose follower profile appeared to be out of sorts from the analysis sketched in Visualising Activity Around a Twitter Hashtag or Search Term Using R). 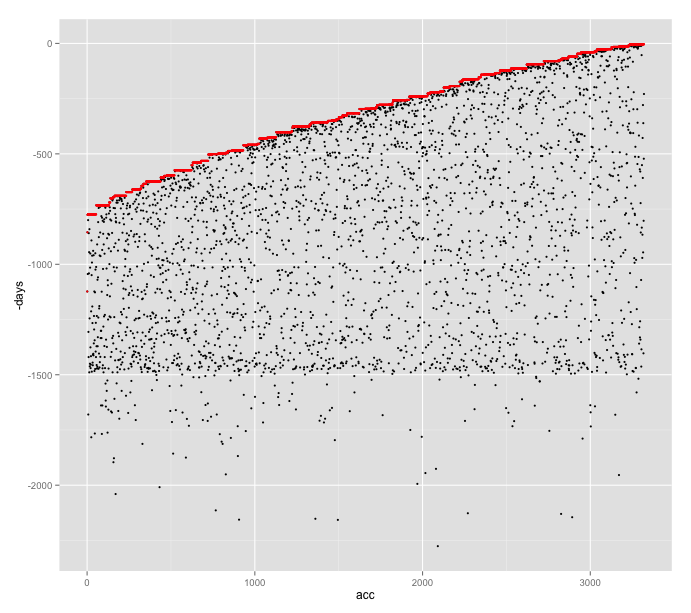 I’ve corrected the x/y axis ordering so follower accession number is now the vertical, y-component. The black dots reveal how many days ago a particular follower joined Twitter. The red line is the estimate of when a particular follower started following the account, estimated based on the most recently created account seen to date amongst the previously acceded followers. We see steady growth in follower numbers to start with, and then the account appears to have been spam followed? (Can you spot when?! ;-) The clumping of creation dates of accounts during the attack also suggests they were created programmatically. PS after coming up with this recipe, I did a little bit of “scholarly research” and I learned that a similar approach for estimating Twitter follower acquisition times had already been described at least once, at the opening of this paper: We Know Who You Followed Last Summer: Inferring Social Link Creation Times In Twitter – “We estimate the edge creation time for any follower of a celebrity by positing that it is equal to the greatest lower bound that can be deduced from the edge orderings and follower creation times for that celebrity”. I started off with a data grab, pulling down the IDs of accounts on a particular Twitter list and then looking up the user details for each follower. This gives summary data such as the number of friends, followers and status updates; a timestamp for when the account was created; whether the account is private or not; the “location”, as well as a possibly more informative timezone field (you may tell fibs about the location setting but I suspect the casual user is more likely to set a timezone appropriate to their locale). This particular view shows a few outliers, and allows us to spot a couple of accounts that have recently had a ‘change of use’. 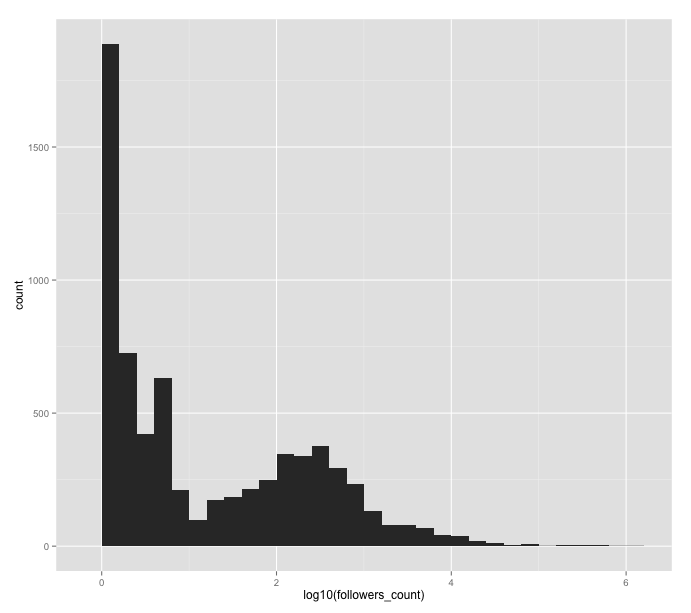 As well as looking at the stats across the set of MPs, we can pull down the list of followers of a particular account (or sample thereof – I grabbed the lesser of all followers or 10,000 randomly sampled followers from a target account) and then look at the summary stats (number of followers, friends, date they joined Twitter, etc) over those followers. …sort of. There’s something obviously odd about that graph, isn’t there? The “step up” at a friends count of 2000. This is because Twitter imposes, in most cases, a limit of 2000 friends on an account. 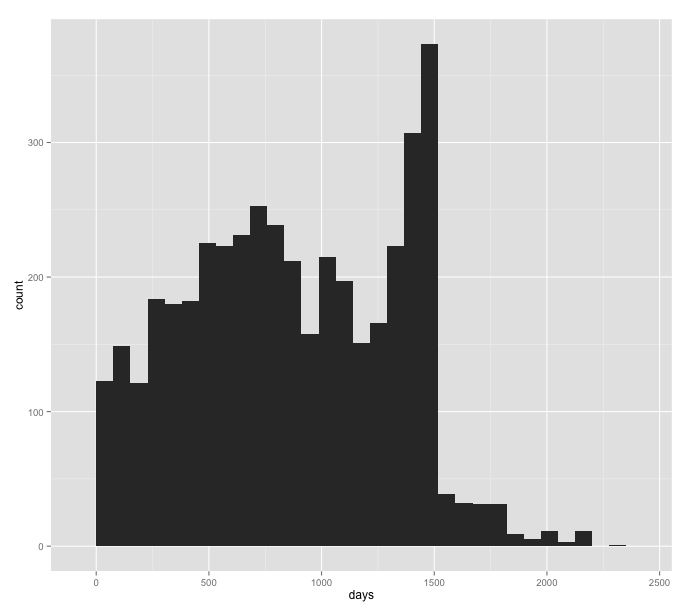 How about the followers per day for an account versus the number of days that account has been on Twitter, with outliers highlighted? There’s obviously something not quite, erm, normal(?!) about this account (at least, at the time I grabbed the data, there was something not quite normal etc etc…). 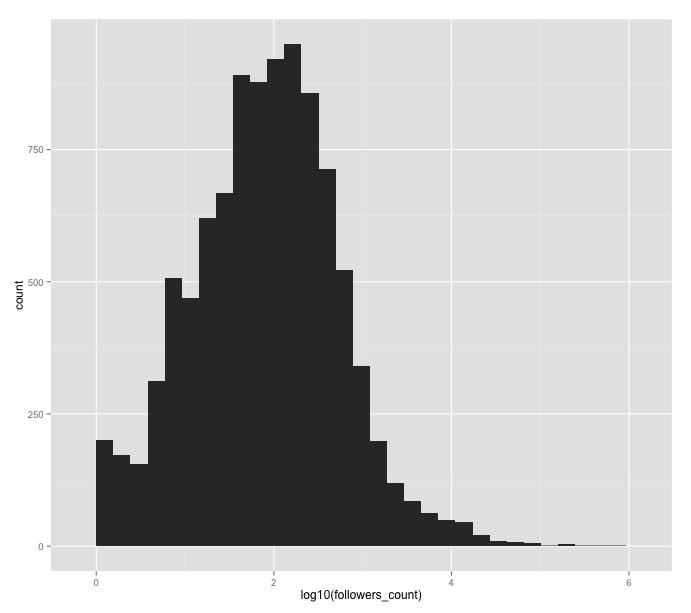 When we get stats from the followers of a set of folk, such as the members of a list, we can generate summary statistics over the sets of followers of each person on the list – for example, the median number of followers, or different ratios (eg mean of the friend/follower ratios for each follower). Lots of possible stats – but which ones does it make sense to look at? 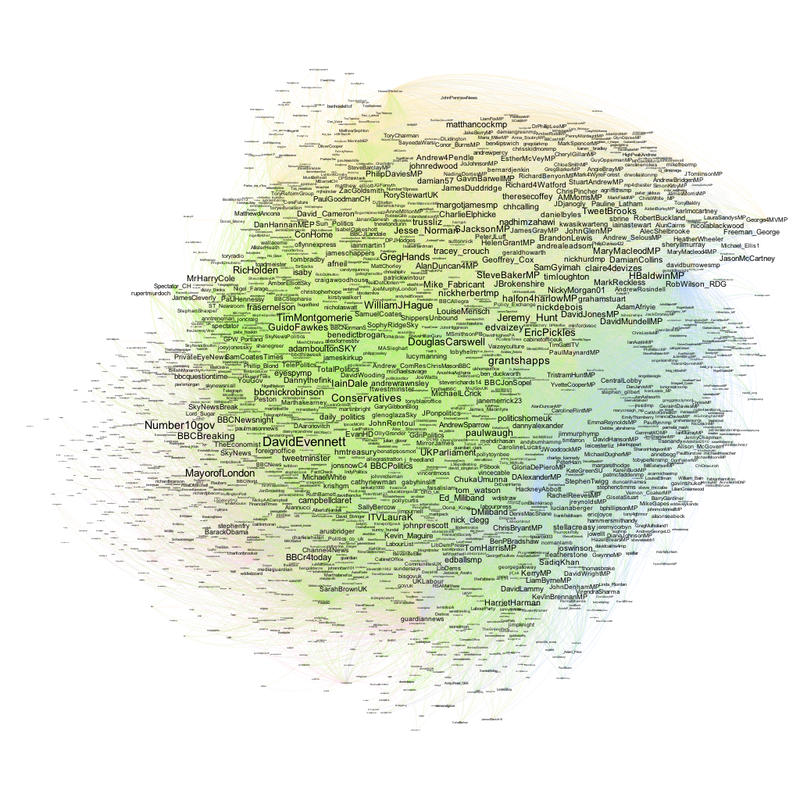 Earlier this year I doodled a recipe for comparing the folk commonly followed by users of a couple of BBC programme hashtags (Social Media Interest Maps of Newsnight and BBCQT Twitterers). Prompted in part by a tweet from Michael Smethurst/@fantasticlife about generating an ESP map for UK politicians (something I’ve also doodled before – Sketching the Structure of the UK Political Media Twittersphere) I drew on the @tweetminster Twitter lists of MPs by party to generate lists of folk commonly followed by the MPs of each party. There’s still a fair bit to do making the methodology robust (for example, being able to cope with comparing folk commonly followed by different sets of users where the size of the set differs to a significant extent (for example, there is a large difference between the number of tweeting Conservative and LibDem MPs). I’ve also noticed that repeatedly running the comparison.cloud code turns up different clouds, so there’s some element of randomness in there. I guess this just adds to the “sketchy” nature of the visualisation; or maybe hints at a technique akin to the way a photogrpaher will take multiple shots of a subject before picking one or two to illustrate something in particular. Which is to say: the “truthiness” of the image reflects the message that you are trying to communicate. The visualisation in this case exposes a partial truth (which is to say, no absolute truth), or particular perspective about the way different groups differentially follow folk on Twitter. A couple of other quirks I’ve noticed about the comparison.cloud as currently defined: firstly, very highly represented friends are sized too large to appear in the cloud (which is why very commonly followed folk across all sets – the people that appear in the commonality cloud – tend not to appear) – there must be a better way of handling this? Secondly, if one person is represented so highly in one group that they don’t appear in the cloud for that group, they may appear elsewhere in the cloud. (So for example, I tried plotting clouds for folk commonly followed by a sample of the followers of @davegorman, as well as the people commonly followed by the friends of @davegorman – and @davegorman appeared as a small label in the friends part of the comparison.cloud (notwithstanding the fact that all the followers of @davegorman follow @davegorman, but not all his friends do… What might make more sense would be to suppress the display of a label in the colour of a particular group if that label has a higher representation in any of the other groups (and isn’t displayed because it would be too large)). A similar problem can occur when folk are livetweeting an event – for a short period, one or two users can dominate a stream with a steady outpouring of live tweets. For Twitter users using a Twitter client that supports global filtering of tweets across all streams within a client, we may be able to set up a filter to exclude tweets of the form (@GuardianData AND #vote2012). This is a high maintenance approach, though, and will lead to the global filter getting cluttered over time, or at least requiring maintenance. The third approach – again targeted at folk who can set up global filters – is for @GuardianData to include a volume control in their tweets, eg Mayor referendum results summary: Bradford NO (55.13% on ), Manchester NO (53.24%), Coventry NO (63.58%), Nottingham NO (57.49%) #vote2012 #blitz. Now users can set a volume control by filtering out terms tagged #gblitz. To remind people that they have a volume filter in place, @GuardianData could occasionally post blitz items with #inblitz to show folk who have the filter turned on what they’re missing? Downsides to this approach are that it pollutes the tweets with more confusing metadata maybe confuses folk about what hashtag is being used. A more generic approach might be to use a loudness indicator or channel that can be filtered against, so for example channel 11: ^11 or ^loud (reusing the ^ convention that is used to identify individuals tweeting on a team account)? Reminders to folk who may have a volume filter set could take the form ^on11 or ^onloud on some of the tweets? Semantic channels might also be defined: ^ER (Election Results), ^LT (Live Tweets) etc, again with occasional reminders to folk who’ve set filters (^onLT, etc, or “We’re tweeting local election results on the LT ^channel today”)). Again, this is a bit of a hack that’s only likely to appeal to “advanced” users and does require them to take some action; I guess it depends whether the extra clutter is worth it? So – any other volume control approaches I’ve missed? 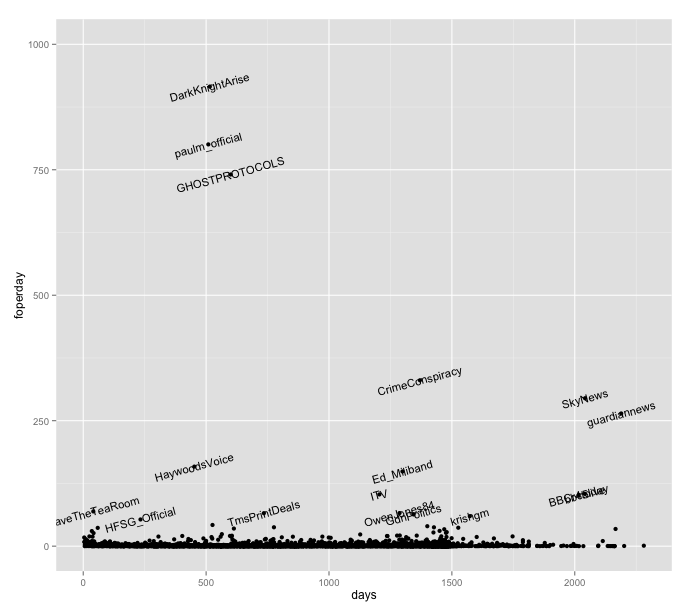 PS I also created a script that generated a wealth of other charts around the lak12 hashtag [PDF]. The code used to generate the report can be found as the file exampleSearchReport.Rnw in this code repository.